Redearslider.com :: View topic - Is my red eared slider's shell ok? 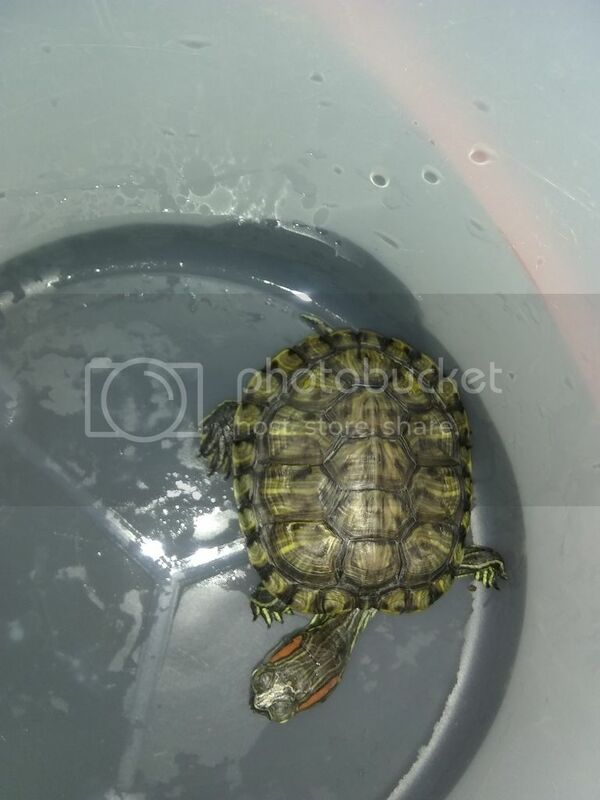 General Care Discussion :: Is my red eared slider's shell ok? Posted: Mon Oct 16, 2017 12:30 am Is my red eared slider's shell ok? Posted: Tue Oct 17, 2017 9:34 am Re: Is my red eared slider's shell ok? See a lot of fungus you need to treat. Use the search box for fungus treatment and see in detail what's best. Also more time and attention is needed to there home to remove the cause of the fungus. If you treat properly and only put it back in the same conditions it will come back with a vengeance ! You may want to read on this forums main page for some good advice. A good setup can prevent 80% of turtles health problems along with a well balance varied and nutritious diet. PS 10/17 3pm : The part of the shell I can see in photo of second turtle it also has fungus ! You need to treat both and correct the tank. You must have hard water in your area also a few mineral deposits. Last edited by litefoot on Tue Oct 17, 2017 4:53 pm, edited 2 times in total. Posted: Tue Oct 17, 2017 10:12 am Re: Is my red eared slider's shell ok? Can you post a pic of your other turtle as well ? Posted: Sat Oct 21, 2017 4:42 am Re: Is my red eared slider's shell ok? not sure how to reply with a pic but I donated the big turtle and ordered a baby red eared slider, So just keep em separated until fungus goes away and clean tank very well? Posted: Sat Oct 21, 2017 8:41 am Re: Is my red eared slider's shell ok? Can you give name and where you donated it to . Always good to have names / states with organizations that take turtles to help others. It will not go away on it's own you must : Treat / fix tank / separation on the new one ! Posted: Sat Oct 21, 2017 5:25 pm Re: Is my red eared slider's shell ok? Posted: Sat Oct 21, 2017 6:30 pm Re: Is my red eared slider's shell ok? Understand about donation. You may want to read fungus treatment again. Even with proper treatment and proper "RX" takes 7-10 days to correct. Posted: Sat Oct 21, 2017 7:35 pm Re: Is my red eared slider's shell ok? During this process you will have a week to 10 days to correct there regular tank ! If not problem will just come back ! 1) Setup a dry dock tank / container. "Quarantine" tank No water . Keep temps normal for the turtle. Do Not Over Heat the turtle ! Keep the lights on a timer as day/night. 2) Clean turtle's shell with betadine or povidone -iodine or a surgical scrub solution. Let turtle "air" dry in warm setting for about an hour. 3) Now apply thin layer of Silver Sulphadinze cream. It's a "RX" in the US ! Place into quarantine tank / container 18-20 hours each day ! 4) During this time once or twice a day remove turtle clean him with say the iodine let dry and place in a clean water supply ( not the problem tank ) so it may rehydrate and you can feed turtle during this process ! Let him swim and drink and eat for an hour or two to assure rehydration ! This is very stressful on a turtle and Must hydrate them ! 5)Repeat above ! Clean / cream / dry dock / rehydrate 18-20 hours each day , done for a week to ten days . Do not forget the rehydration steps ! Also watch the quarantine tank temps ! 6) All this is for "NOT" if you do not clean / sterilize it's regular home from the living microorganisms that caused the problem. You will have a week to get that done ! 7) You must give more time and attention and maintenance to its regular home or this will happen again. once cured place in regular home. 9) if you feel to much for you a Herp Vet will be happy to do it for a lot of money. Good luck , it works ! Posted: Wed Oct 25, 2017 12:05 am Re: Is my red eared slider's shell ok? Posted: Thu Oct 26, 2017 1:19 pm Re: Is my red eared slider's shell ok?